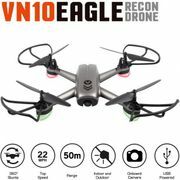 Looking for cool drones? We bring you the latest drone deals as shared by our team of awesome bargain hunters. 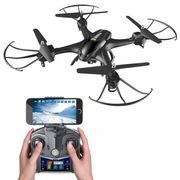 You can choose from a variety of drones whether you prefer remote-controlled ones, app-controlled ones, mini drones and foldable drones with camera. You can find the best deals and the cheapest rates which will definitely help you save and help you on your purchasing decisions. Check out deals from Amazon, Argos, Tomtop, ebay, Ideal World, Maplin and Halfords. You can use voucher codes and you can use special offers for free delivery, too. Mini Drone for Beginners and Children - Half Price with Code ! 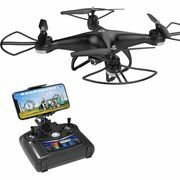 Get the cool drone you’ve been eyeing and get some money with the help of voucher codes at Latest Deals! Drones are very in demand in right now. In the tech world, drones are a hot topic and everyone is talking about it. People all over the world make use of this new technology for various purposes including gaming, entertainment, government projects, documentaries, exploration, and more. People of all ages want to fly drones. From kids to adults, everyone cannot get enough of flying around with this sophisticated machine. Although drones are not hard to find and buy, keep in mind that these kinds of aerial machines are not cheap. Some drones even cost a lot of money most especially those high-end ones. Basically If you are going to use it for professional purposes, it is good deal of investment and you should only buy high quality items. But if you are only going to use it for leisure or playing around with your kid, then you should opt for cheaper ones. Drone technology is advancing rapidly and you should know the pros and cons of each drone. Be familiar with the specifications of each product and how can it make your drone operating experience more fun and exciting. The most important thing in purchasing drones is not to rush in buying the first thing that you see. Choose the right one that will suit your purpose and budget. Where Can I Find the Best Cheap Drone Deals Online? When it comes to finding cheap drone deals, we got you covered. Here at Latest Deals, our community of bargain hunters have gathered the best drones for sale in the internet. You can also save a lot of money on your purchases when you use cheap drones discount codes and vouchers. Kids and adults are fond of flying these fascinating machines. This is the reason why these flying machines are very in demand right now. But most of these units cost a lot. Luckily for you, when you use cheap drones UK vouchers, you can save a lot of money. Here we got the best deals that you can take advantage of. You can even purchase drone camera at very affordable prices. You can purchase cheap drones from your favourite UK retailers including Amazon and Argos. Just use the latest drone discount codes and you are good to go. You can save money on delivery charges when you buy a Drone at Afternic. Smyths Toys Superstores is also offering their Race Drones at Half Price. If that is not what you are looking for, you can buy a Drone with VR glasses at Sports Direct where you can save as much as £60. Drones Argos. If you are looking for an Underwater Drone you can buy it at Argos and get £200 off. You can also get a 33% Discount when you buy a Quadcopter Drone. They are also offering a Parrot Swing Drone at Half Price. Drones Amazon. If you want to purchase a Mini Drone with Video Camera, you can save as much as £24 when you buy it at Amazon. They are also offering a Mini Drone for Kids which can save you £80. If you want to get a high end one, they have a Quadcopter Drone with Sky controller plus Cockpit FPV Glasses. You can save as much as £230 for this special offer. If you are just starting off, invest in a Beginner Drone with HD FPV Camera and get more than 35% off..
Design – The design of the drone has a great influence to its flying capabilities. You should think about whether if you want to get a quadcopter, hexacopter or an octocopter. Speed and Elevation - If you want more elevation and speed, you should get a bigger drone. The size of the drone can greatly influence its speed because the bigger the unit is, the bigger the engine it has. Battery Life – This determines the amount of time it will stay airborne. You should choose a drone that has a longer battery life so that you can maximize its capabilities. Buy one that can provide you with more than 20 minutes of flight time. Controllable Range – This refers to that distance in which you can control the drone. There are certain distance limits that you should follow to control the unit effectively. Before buying a drone, check the controllable range of the unit. Camera – If you are going to buy a drone with a camera attached to it, purchase one that has an HD camera that is capable of capturing clear images. Drones of these types are somewhat bigger since HD cameras are heavy. Replacement Parts – Make sure that the drone that you will buy has replaceable parts and there are stock available so that you can repair them if ever they get damaged. These kinds of flying machines fall a lot thus requiring them to have parts replaced often times. Recreational Purposes. If you are going to buy a drone for recreational purposes, it is best to get a unit that is easy to operate and has very responsive controls. There are many drones in the market today that are intended for personal use. These drones are not that expensive. Commercial Purposes. If you are going to get a drone for commercial purposes, you should do extensive research since you will be using it for a particular task. You need to find the one that can deliver you quality results. People who use drones for aerial photography/videography purchase a unit that has an HD camera mounted to it. Although these drones are quite expensive, they are worth the investment if they can deliver quality output.